On 31 January 1968 news broke of a huge wave of attacks across South Vietnam on US and South Vietnamese positions by the Vietnamese national liberation forces, including an assault on the US embassy compound in the south’s capital Saigon. The significance of this went far beyond a military offensive – which ultimately failed. Tet totally undermined the claims by President Johnson and the Pentagon, stepped up particularly in 1967 – a pre-election year – that the Vietnam War was as good as over; that ‘victory was just around the corner’. It gave the lie to US claims that its intervention had virtually 100 per cent support in South Vietnam; it did not take a genius to understand that if there were thousands of hostile troops active in Saigon, then there must have been 10s of 1000s more in the city who knew they were there, were party to their plans and had given them implicit or direct support. The inability of the Army of the Republic of Vietnam (ARVN) to win without US support was completely exposed and the balance of opinion in US population shifted sharply against the war. Although the Tet Offensive itself was beaten back by the US, it marked the decisive turning point in the war; the moment when it became clear that, even if not now, the US would inevitably lose. As a result support for Johnson fell away in the US, and eventually he did not even run for President later that year; while across the world, but in the US in particular, the movement against the Vietnam War grew exponentially in size and militancy. Tet – the Vietnamese name for the Spring festival or East Asian New Year – saw North and South Vietnamese liberation forces launch an offensive in 36 out of 44 provincial capitals in the South; 64 out of 242 district capitals and 5 of 6 major cities. The scenes of fighting attack when a 15-strong NLF group broke into the US embassy compound in Saigon in particular sent a shock wave around the world, even though the attack was repelled without them entering the embassy. The Vietnamese Communist Party (VCP) had been preparing this Winter/Spring Offensive of 1967/1968 since a meeting of its Central Committee in early 1967. It was flexible in its prognosis of the likely outcome; it did not hinge its tactics on achieving a decisive victory, but saw it at least achieving a better relationship of forces in the next stage in the protracted war and at the same time understood it might lead to an escalation of the US war drive. The liberation forces’ offensive seemed to come out of the blue. But the US had in fact been warned of the plans, however the US Generals believed their own propaganda that the liberation forces were all but defeated and did not take the threat seriously. The US commander, General Westmoreland, instead prioritised responding to a smaller, more conventional attack at the US Khe Sanh base – a deliberate distraction tactic by the Vietnamese. The Tet Offensive was to last seven months. The initial assaults were led by local forces aiming to ignite an urban revolt. Regular reserves stood by to exploit any breakthroughs. In Saigon 1000 PAVN troops held off over 11,000 ARVN and US troops and police for three weeks. In Hue 1000 PAVN regulars held out until 24 February in the face of massive bombing with 80 per cent of the city reduced to rubble. The Tet Offensive is an inspirational example of sacrifice and heroism in the face of imperialism. But Tet also made a huge contribution to the practice and theory of the international socialist movement through the discussion of the VCP in preparing the offensive and drawing the lessons of its outcome in conducting the rest of the war. The VCP’s tactics highlighted the vital importance for revolutionary success of bringing together a strategic focus and complete tactical flexibility. The VCP’s discussions applied Mao’s principle On Protracted War in conjunction with offensive revolutionary war and combined political and military struggle in urban and rural locations. Tet led to profound discussions within the VCP. Some argued that the offensive had been a mistake and others said that with more resources it could have been more successful. It led to a reappraisal of strategy and a reassessment of the situation in the cities and the new alliances needed moving forward. The VCP had always understood that the success of the Vietnamese revolution did not just lie in Vietnam. Nor for that matter just in the United States. It was acutely aware of the political and economic pressures on the US and also the importance of its relationship with other imperialist states. The VCP factored into its actions the relative decline of the US economy and the economic challenge posed to the US by post-war rise of Germany and Japan, as well as the damage caused to the US economy by the dollar crisis in the late 1960s. The US budget deficit grew from $8.7bn in 1967 to $25.2bn in 1968. Inflation was 6.1 per cent in 1969. It had been 1.3 per cent from 1960-1965 and 4.5 per cent from 1965-1969. The balance of payments deficit grew from $3.3bn 1964 to $9.4bn in 1968. The gold dollar crisis revealed an increasing unwillingness of other imperialist economies to subsidise the US war effort. The Vietnam War was imposing unbearable strains on the US economy and the ability of President Johnson to deliver on his Great Society programme to expand social reform and benefits. In short, the US could not afford the Great Society and the war. The Tet Offensive was timed to deepen these pressures, opening up fault lines which had been developing since the escalation of the US involvement after the dramatic escalation of the US bombing after 1965 and the deployment of over 500,000 troops. Initially the impact of Tet was an increase in support for the war in January and February 1968, but by March 49 per cent Americans thought the war was a mistake with only 41 per cent thinking it was correct. It particularly had a direct impact on the US presidential campaign. Support for President Johnson began to fall away, and in March 1968 he was nearly defeated in a Democratic Primary by the anti-war Senator, Eugene McCarthy. When a more dangerous rival, Robert Kennedy, declared his intention to run on a platform of ending the war, Johnson decided not to run for re-election. Republican Nixon won the presidency in November 1968 on a platform of ‘Vietnamisation’ of the war and the withdrawal of US ground troops. In the wake of Tet, General Westmoreland also failed in his bid to increase the number of troops by 206,000. In reality the highest point in the US military commitment to stay in Vietnam had already been achieved. The full departure of the US was a matter of time. The Vietnam War forced the US to ensure that in future conflicts ground conflicts would be avoided to reduce US casualties and the mass opposition provoked by US soldiers coming home in body bags. And in the future the media coverage of US military action was to be tightly controlled. There was to be no new ‘credibility gap’ between what the government claimed was happening and what people saw graphically illustrated in the media. But while the tactics changed, the US ruling class has proved no more capable of controlling the information about its wars today than it could control the truth coming out about Vietnam. The publication of the Pentagon Papers in 1971 exposed the lies and duplicity of the US state and its political leaders over Vietnam. In more recent times Edward Snowden and Wikileaks have done the same. The legacy of Tet lives on. 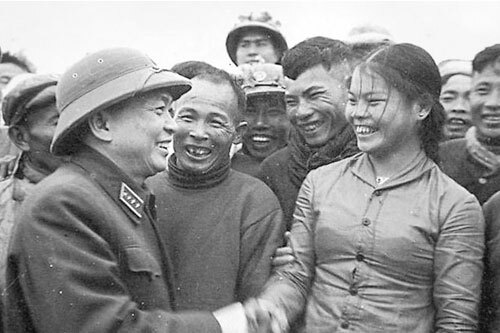 The determination of the Vietnamese people to achieve their liberation is a shining example to socialists everywhere. One that should be studied and learned from.